Home » News » Legendary Thrash Band Returns From The Dead! Vinnie La Bella and Kyle Thomas have revived Exhorder, the legendary New Orleans thrash act that delivered an all time thrash metal classic in the formidable shape of Slaughter In The Vatican and invented groove metal along the way! Fans would have died from asphyxiation holding their breath waiting for this reformation, but it has happened and the band have signed a worldwide management deal with All Independent Service Alliance (AISA) . 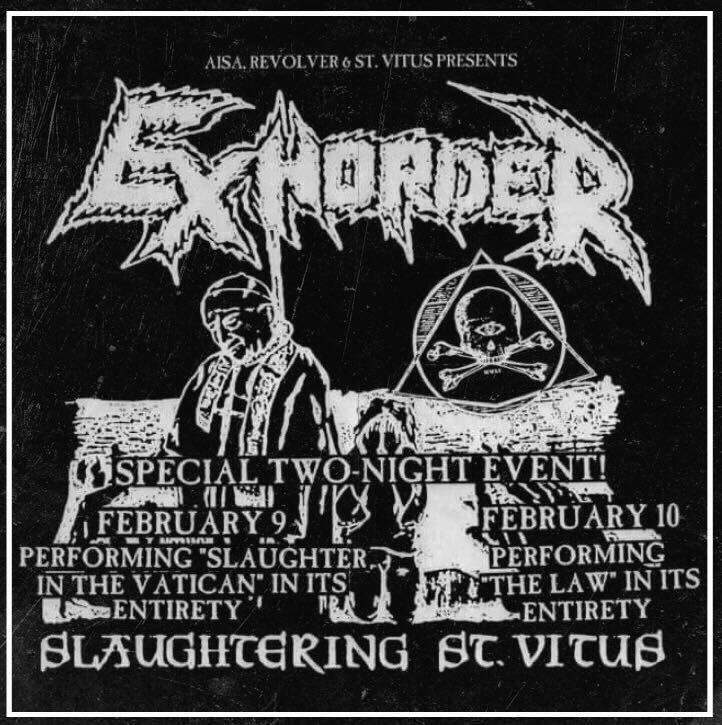 As mentioned, the Exhorder reunion is lead by founding members Vinnie LaBella (Guitar) and Kyle Thomas (Vocals) who are joined by Jason Viebrooks (Heathen) on bass, Marzi Montazeri (ex-Superjoint Ritual, ex-Phil Anselmo & The Illegals) on guitar and Sasha Horn (Forbidden) on drums. 2018 will be extremely exciting for the band, as Exhorder will play their first shows in the US in February and are planning on taking summer festivals by storm! The band’s first two US shows will be held at St Vitus Bar in Brooklyn, where they will play their legendary first album Slaughter in the Vatican on Friday, February 9th, and their sophomore album The Law on Saturday, February 10th. The band will also play a homecoming show in New Orleans at Southport Hall on February 12th, Lundi Gras.